Fresh blueberries are at their peak in North America in June and July. Watermelon peaks June through August. 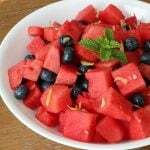 Place watermelon and blueberries in a large bowl. Lightly sprinkle with salt. Mix gently enough that you won't nick the blueberries. Garnish with lemon zest and mint, if desired.